Known for: Doris Lessing has written many novels, short stories, and essays, most about contemporary life, often pointing to social injustices. Her 1962 The Golden Notebook became an iconic novel for the feminist movement for its consciousness-raising theme. Her travels to many places in the British sphere of influence have influenced her writings. Doris Lessing was born in Persia (now Iran), when her father worked for a bank. In 1924, the family moved to Southern Rhodesia (now Zimbabwe), where she grew up, as her father tried to make a living as a farmer. Though she was encouraged to go to college, Doris Lessing dropped out of school at age 14, and took clerical and other jobs in Salisbury, South Rhodesia, until her marriage in 1939 to a civil servant. When she divorced in 1943, her children stayed with their father. Her second husband was a Communist, whom Doris Lessing met when she also became a Communist, joining what she saw as a more "pure form" of Communism than she saw in the Communist parties in other parts of the world. (Lessing rejected Communism after the Soviet invasion of Hungary in 1956.) She and her second husband divorced in 1949, and he emigrated to East Germany. Later, he was the East German ambassador to Uganda and was killed when Ugandans revolted against Idi Amin. During her years of activism and married life, Doris Lessing began writing. In 1949, after two failed marriages, Lessing moved to London; her brother, first husband, and two children from her first marriage remained in Africa. In 1950, Lessing's first novel was published: The Grass Is Singing, which dealt with issues of apartheid and interracial relationships in a colonial society. She continued her semi-autobiographical writings in three Children of Violence novels, with Martha Quest as the main character, published in 1952-1958. Lessing visited her African "homeland" again in 1956, but was then declared a "prohibited immigrant" for political reasons and banned from coming back again. After the country became Zimbabwe in 1980, independent of British and white rule, Doris Lessing returned, first in 1982. She wrote of her visits in African Laughter: Four Visits to Zimbabwe, published in 1992. Having rejected communism in 1956, Lessing became active in the Campaign for Nuclear Disarmament. In the 1960s, she became skeptical of progressive movements and more interested in Sufism and "nonlinear thinking." In 1962, Doris Lessing's most widely-read novel, The Golden Notebook, was published. This novel, in four sections, explored aspects of the relationship of an independent woman to herself and to men and women, in a time of re-examining sexual and political norms. While the book inspired and fit in with increasing interest in consciousness-raising, Lessing has been somewhat impatient with its identification with feminism. Beginning in 1979, Doris Lessing published a series of science fiction novels, and in the 80s published several books under the pen name Jane Somers. Politically, in the 1980s she supported the anti-Soviet mujahideen in Afghanistan. She also became interested in issues ecological survival and returned to African themes. Her 1986 The Good Terrorist is a comedic story about a cadre of left-wing militants in London. Her 1988 The Fifth Child deals with change and family life in the 1960s through 1980s. Lessing's later work continues to deal with people's lives in ways that highlight challenging social issues, though she's denied that her writing is political. 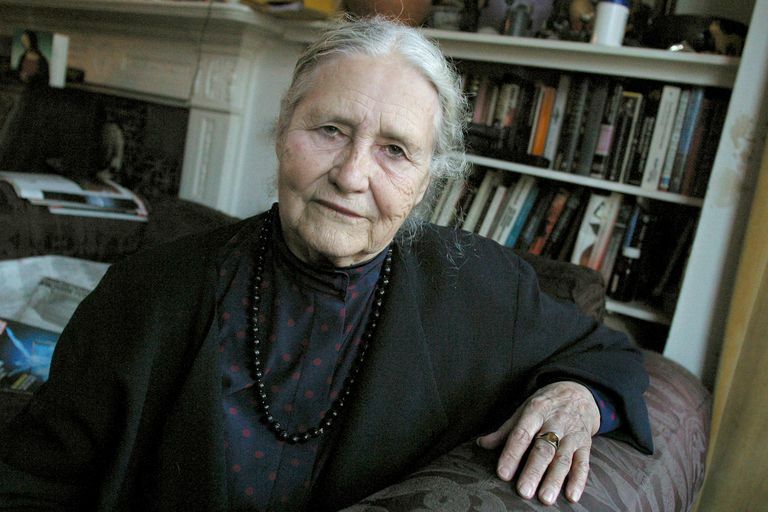 In 2007, Doris Lessing was awarded the Nobel Prize for Literature. • The Golden Notebook for some reason surprised people but it was no more than you would hear women say in their kitchens every day in any country. • That is what learning is. You suddenly understand something you've understood all your life, but in a new way. • Some people obtain fame, others deserve it. • Think wrongly, if you please, but in all cases think for yourself. • Any human anywhere will blossom in a hundred unexpected talents and capacities simply by being given the opportunity to do so. • There is only one real sin and that is to persuade oneself that the second-best is anything but second best. • What's really terrible is to pretend that the second-rate is the first-rate. To pretend that you don't need love when you do, or you like your work when you know quite well you're capable of better. • You only learn to be a better writer by actually writing. • I don't know much about creative writing programs. But they're not telling the truth if they don't teach, one, that writing is hard work, and, two, that you have to give up a great deal of life, your personal life, to be a writer. • The current publishing scene is extremely good for the big, popular books. They sell them brilliantly, market them and all that. It is not good for the little books. • Trust no friend without faults, and love a woman, but no angel. • Laughter is by definition healthy. • This world is run by people who know how to do things. They know how things work. They are equipped. Up there, there's a layer of people who run everything. But we -- we're just peasants. We don't understand what's going on, and we can't do anything. • It is terrible to destroy a person's picture of himself in the interests of truth or some other abstraction. • What is a hero without love for mankind? • In university they don't tell you that the greater part of the law is learning to tolerate fools. • With a library you are free, not confined by temporary political climates. It is the most democratic of institutions because no one - but no one at all - can tell you what to read and when and how. • Nonsense, it was all nonsense: this whole damned outfit, with its committees, its conferences, its eternal talk, talk, talk, was a great con trick; it was a mechanism to earn a few hundred men and women incredible sums of money. • All political movements are like this -- we are in the right, everyone else is in the wrong. The people on our own side who disagree with us are heretics, and they start becoming enemies. With it comes an absolute conviction of your own moral superiority. There's oversimplification in everything, and a terror of flexibility. • Political correctness is the natural continuum from the party line. What we are seeing once again is a self-appointed group of vigilantes imposing their views on others. It is a heritage of communism, but they don't seem to see this. • It was OK, us being Reds during the war, because we were all on the same side. But then the Cold War started. • Why were the Europeans bothered about the Soviet Union at all? It was nothing to do with us. China had nothing to do with us. Why were we not building, without reference to the Soviet Union, a good society in our own countries? But no, we were all -- in one way or another -- obsessed with the bloody Soviet Union, which was a disaster. What people were supporting was failure. And continually justifying it. • All sanity depends on this: that it should be a delight to feel heat strike the skin, a delight to stand upright, knowing the bones are moving easily under the flesh. • I have found it to be true that the older I've become the better my life has become. • The great secret that all old people share is that you really haven't changed in seventy or eighty years. Your body changes, but you don't change at all. And that, of course, causes great confusion. • And then, not expecting it, you become middle-aged and anonymous. No one notices you. You achieve a wonderful freedom. • For the last third of life there remains only work. It alone is always stimulating, rejuvenating, exciting and satisfying. • Bed is the best place for reading, thinking, or doing nothing. • Borrowing is not much better than begging; just as lending with interest is not much better than stealing. • I was brought up on the farm in the bush, which was the best thing that happened, it was just a wonderful childhood. • None of you [men] ask for anything -- except everything, but just for so long as you need it. • A woman without a man cannot meet a man, any man, without thinking, even if it's for a half second, perhaps this is the man.